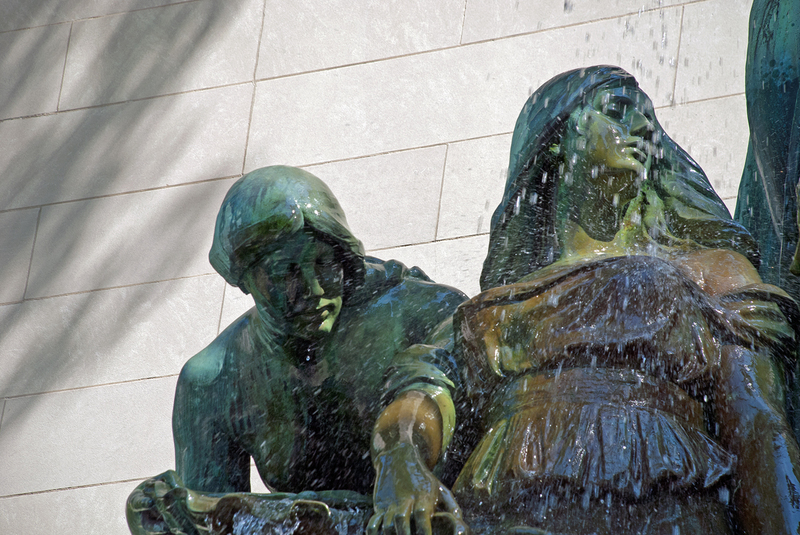 With a touch of a button on this very day 99 years ago, a little girl, the daughter of sculptor Lorado Taft, started water flowing from shell to shell in The Fountain of the Great Lakes, a sculpture that can be seen today in front of the west wall of the Ferguson Wing of the Art Institute of Chicago. Lorado Taft was born in Elmwood, Illinois on April 20, 1860. He received his degree from the University of Illinois in 1879, stayed for another year to earn his Master’s degree and then attended the Ecole des Beaux Arts in Paris, the most prestigious school for design in the world, until 1883. The sculptor opened his studio in Chicago in January of 1886 and began his career as an instructor at the Art Institute of Chicago that same year. He went on to teach at both the University of Chicago and the University of Illinois. He also worked as part of a team of sculptors assembling the vast collection of sculptural work at the 1893 World’s Columbian Exposition. He spent his life trying to achieve that grand vision. At the age of 76, Lorado Taft died at his home at 6016 North Ingleside, just off the Midway Plaisance, on October 30, 1936. The Fountain of the Great Lakes had its birth in a casual conversation between two Chicago giants as Lorado Taft and Daniel Burnham rode to their homes in Evanston on a commuter train shortly after the 1893 World’s Columbian Exposition. Benjamin Ferguson was born in Columbia, Pennsylvania in 1839 and was among that generation of adventurers who came to Chicago just prior to the fire in 1871 and made their fortune. Ferguson worked exclusively in lumber and made a fortune doing so . . . enough so that after traveling in Europe where he was impressed with the public sculpture, he vowed to bring to Chicago that same sensitivity to public art. Some 20 sculptures in Chicago have been funded by the Ferguson fund. 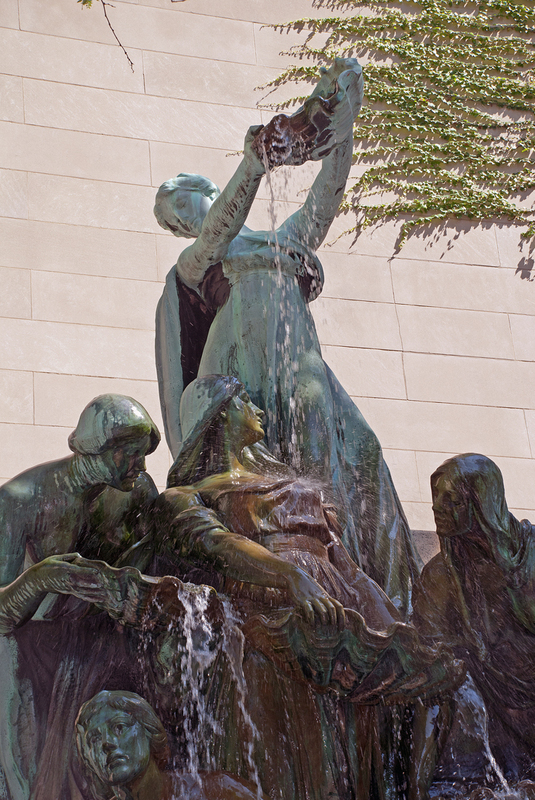 They include such works as the sculptures on the south pylons (Defense and Regeneration) of the DuSable Bridge carrying Michigan Avenue across the Chicago River, Ivan Mestrovic's Bowman and Spearman, just east of Michigan Avenue on Congress, and Henry Moore's Nuclear Energy at the University of Chicago. In the Fountain of the Great Lakes Lorado Taft fashioned a series of female figures, executed in bronze, symbolizing the general flow of the great lakes system with Lake Superior at the top which, along with Lake Michigan, empties into a shell-like container held by Lake Huron. The stream continues onto Lake Erie, which passes the stream onto Lake Ontario. 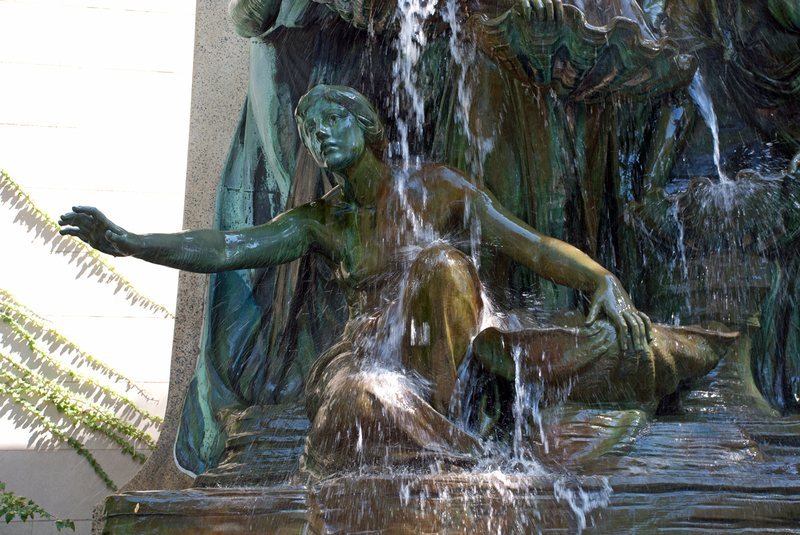 When water first began to flow from lake to lake back on September 9, 1913, the statue faced south and sat on the south side of the original Art Institute building, finished 20 years before. 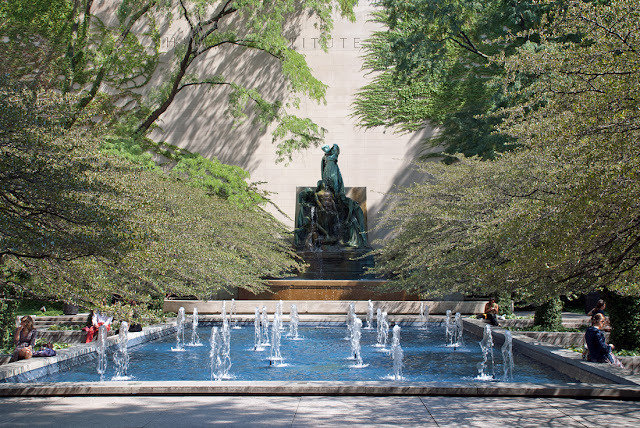 After standing for nearly 50 years in that location the sculptural work was moved so that it now faces west from its position in front of the 1962 Morton Wing of the Art Institute. The move was not without controversy. 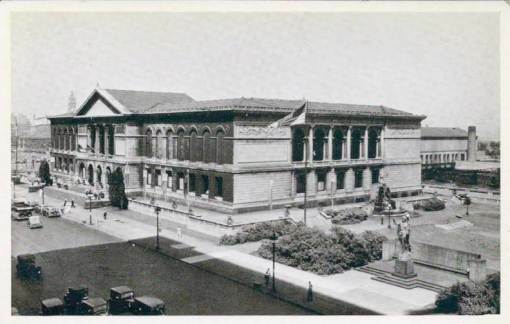 The Chicago Heritage Committee objected to the Art Institute “pushing our statues around.” The committee, which came into being in 1957 in the fight to save Robie House on the city’s south side, was made up of Chicagoans from all walks of life, including Alderman Leon Despres of the Fifth Ward. 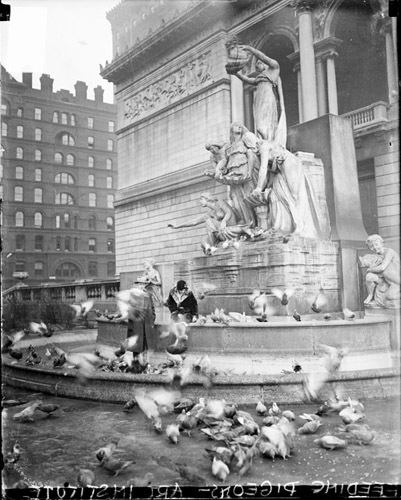 Feeding pigeons at the original site of the fountain . . . 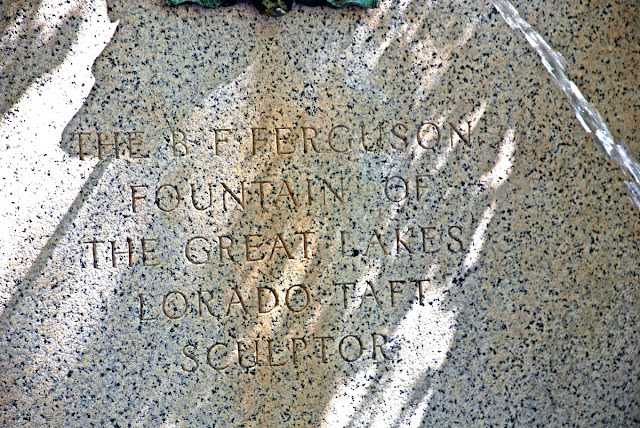 The committee held that the Ferguson fund, which according to the original will of the generous lumber man was to be used for “erection and maintenance of statuary and monuments” had been twisted over the years to suit the needs of the Art Institute. For one thing the 1959 Ferguson Wing of the museum on its north side used $1,600,000 from the fund to construct the $2,300,000 addition. Interestingly enough, the placement of the statue in its new location in 1963 has the piece so close to the west wall of the Morton Wing that no one can even see the back of the thing, a nice, practical way of solving the problem that Mr. Stauffer pointed out. The great sculpture sits in a lovely urban garden completed between 1962 and 1967, the result of a collaboration between two great designers, architect Harry Weese and landscape architect Dan Kiley. On the west side of the space honey locusts and ground cover provide a transitional entrance to this escape from the city. The central plaza is recessed 18 inches and holds a rectangular pool leading one's eyes to the great fountain to the east. On either side of the pool cockspur hawthorn trees provide a canopy over the entire plaza. 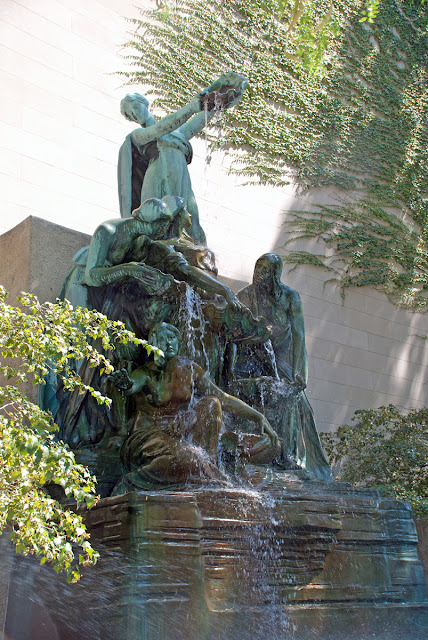 On a sunny, summer’s day, with the water of Lorado Taft’s fountain splashing in the background, I don’t think there is a better place in the city to read a book and eat a take-away lunch. One of my favorite gardens in our whole green city. I love the way the thorn trees and the sunken level and the crunchy gravel make you feel protected and a long way from Michigan Avenue. I went to school in the area and loved to lunch here. And it was, back when, a great place to sneak a smoke during a concert at Orchestra Hall.